This color changing LED light strip is perfect for highlighting a waterfall spillway. Measuring 12" in length, this light strip shows eight different colors, and has variable speed settings. 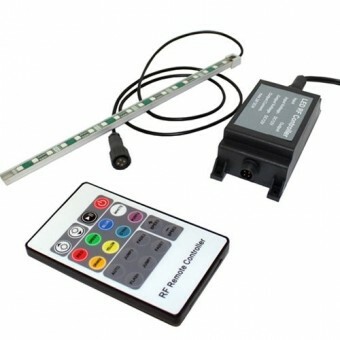 Includes transformer, and a remoter controller. Gorgeous day or night! This product is intended for out of water use. The light strip can withstand rain and water splash, however it was not intended for submerged use. Comes complete with a transformer, and remote controller. Different settings include: Flashing, blended, and variable speed settings. Solid colors include: Red, green, blue, white, cyan, orange, yellow and purple. This product is intended for out of water use. The light strip can withstand rain and water splash, however it was not intended for submerged use.